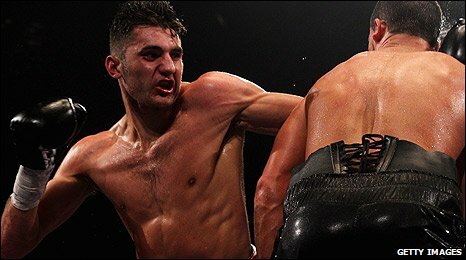 Wales' Nathan Cleverly laboured to a unanimous points win over awkward Frenchman Nadjib Mohammedi. Cleverly, who is edging closer to becoming a world champion, picked up the WBO interim light-heavyweight title at Liverpool's Echo Arena. It was a largely unimpressive performance from the unbeaten 23-year-old, who secured his 21st victory. "That was frustrating, and he was a very awkward opponent" the Cefn Forest fighter admitted. Cleverly could now become the champion in full should Juergen Braehmer fail in his appeal on Monday against a 16-month prison sentence for assault and insulting behaviour. It was a cagey opening round which Cleverly shaded by boxing on the front foot while landing the occasional jab against the fleet-footed Mohammedi. The second round was equally cautious with both fighters hitting fresh air more than each other. The Welshman's frustration showed in the third as he again failed to land a clean shot on Mohammedi with the jab also missing the target too often. The pair traded jabs at the start of the fourth as Cleverly looked to work on the inside and rough up his opponent while the Frenchman appeared dangerous in patches but unsurprisingly referee Dave Parris brought the two fighters together and told them to get on with it. Cleverly, the European champion, continued to force the fight against his negative opponent in the fifth with a couple of snapped jabs at the end of the round finding the target. Mohammedi looked purposeful in the sixth landing a left hook before knocking the Welshman's gum shield out with a later barrage. Cleverly had a point taken off him in the seventh and Mohammedi appeared to hurt him for the first time in the fight as the Frenchman came back into the contest. A cut to the bridge of the nose of Mohammedi spurred the Welshman into action in the eighth as the fight turned into a battle with the pair trading several punches up close. A fierce hook and solid left jab from Cleverly hurt his opponent in the ninth, while a right hand uppercut from the Frenchman also landed flush. The tenth was relatively uneventful as both boxers tired with Cleverly landing a decent right hook over the top of Mohammedi's left hand. Cleverly again landed a decent right in the penultimate round as the 12th petered out in relatively uneventful fashion. The judges were unanimous in their decision, scoring the fight 115-112, 116-111 and 115-113 in the Welshman's favour. "The late change of opponent didn't help," Cleverly admitted. "He was making miss and dragging me in but this is the way it goes sometimes."